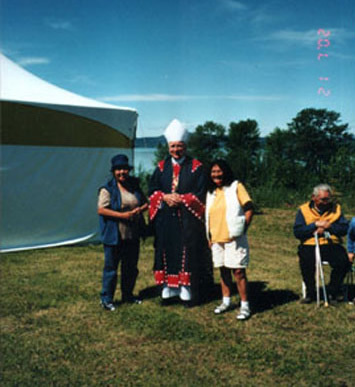 Father Jules Goulet, OMI, is pictured with some friends at the 1991 Lejac Pilgrimage. 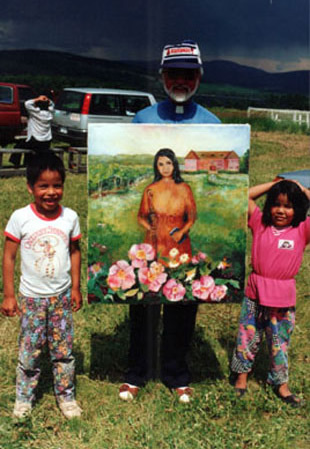 He is holding a painting done by Angela Levy who depicted Rose Prince standing behind a wild rose bush holding both prayer book and talking stick. 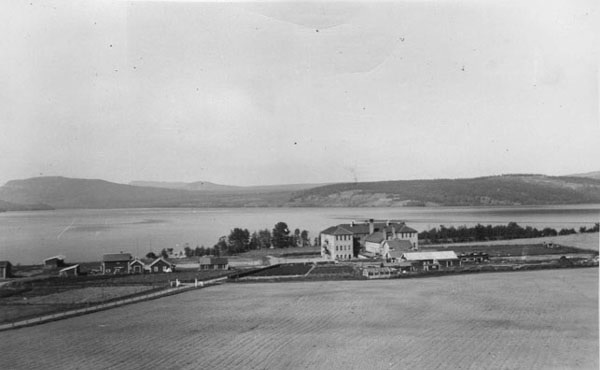 The Lejac Indian Residential School where Rose chose to live after she graduated from the school is pictured in the background. Lejac is situated along the highway, a two-hour drive west of Prince George, between Vanderhoof and Fraser Lake. 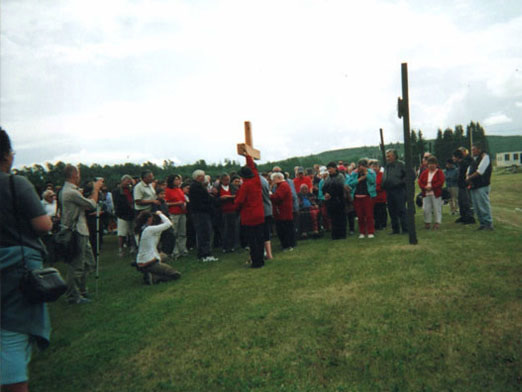 Every summer on the second weekend of July a three-day pilgrimage is held on the grounds where the Lejac Indian Residential School once stood. 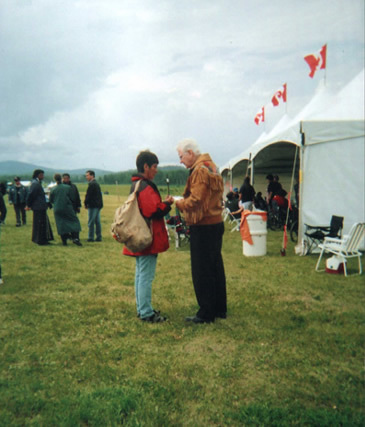 In 1990, responding to the desire of former Lejac Residential School students for a reunion, Father Jules Goulet, OMI, former pastor of St. Andrew’s Parish in Fraser Lake, along with a local elder and childhood friend of Rose Prince, initiated the first pilgrimage. After this very humble beginning when 20 people gathered, awareness of the pilgrimage and the life of Rose Prince grew. It gradually gained momentum with greater collaboration between the First Nations people and others who have built on a common vision and worship. Today people come from near and far to celebrate, pray and honor the memory of Rose Prince. For pilgrims participating in the pilgrimage each summer it is a truly spiritual experience. In 2004, approximately 1200 people came to Lejac – from nearby communities of Fraser Lake, Vanderhoof, Burns Lake, Prince George, Fort Ware, Kitimat, Terrace, and from distant places such as Alberta, Saskatchewan and Vancouver. Prayer and Reflection along with praise and worship are essential parts during the pilgrimage. Many pilgrims say they experience God’s healing presence and power in their lives during the pilgrimage as they pray for real-life issues, hurts and joys. The example of Rose Prince is like a compass, gently guiding the way by her life spent simply with concern for others and a deep love for God. Several years ago Nick Loza, a miner from the Fraser Lake area, experienced a miraculous healing when Father Goulet anointed and prayed over him through the intercession of Rose Prince. After two operations for a broken disc in his back the neurologist had given up hope of further recovery. Though he did not know Rose Prince when she was alive, Nick and his wife attended the pilgrimage in recognition of the healing he received. The Lejac pilgrimage is a community building time of prayer and celebration when old friends meet and new friends are made. It is a time for singing and sharing and, for many, an opportunity to learn about Rose Prince, to connect with the church and to experience healing and peace. Confirmation and First Communion are often celebrated during the pilgrimage, as was the case here in 1995. Some who participate reunite with old schoolmates from the Lejac Residential School. It can become a time of intense spiritual experiences and they feel drawn to return each year to pray at this historical site. Lejac provides a warm and encouraging atmosphere and an opportunity for cultural exchange. Many participants express a great affinity with the First Nations people when they share faith and prayer together. The burning of the sweet grass, the holy water; the old traditions when joined with modern ones make for a powerful combination. A significant dimension is added when ancient customs are recognized and celebrated. Bishop Gerald Wiesner was presented with a button-blanket chasuble at the 2002 pilgrimage. Bishop Gerry credits the present pastor in Fraser Lake, Father Vincent James, OMI, with the continued success of the pilgrimage. 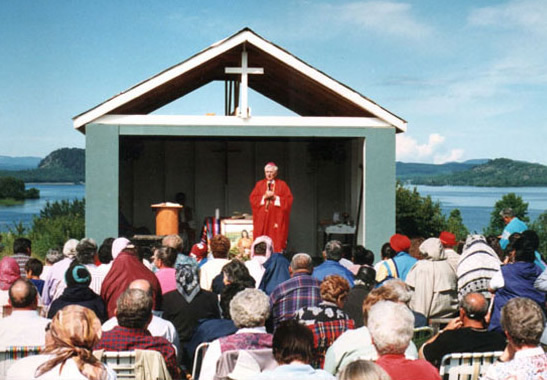 “He has worked hard at this and he is able to get people to rally in support of it.” Sister Kateri Michell, a Mohawk and Sister of St. Anne, was the guest speaker at the 2004 pilgrimage. This was her second visit to Lejac and the message she brought to her own people was well received. Most of the greatest saints are not known to us. In life their holiness was hidden from our eyes and known only to heaven. They drew no attention to themselves but lived quiet and gentle lives of prayer and service to others. Yet sometimes God in his mercy reveals a glimpse of the greatness that has been in our midst unrecognized. Such is the humble life of Rose Prince of the Carrier Nation in British Columbia. 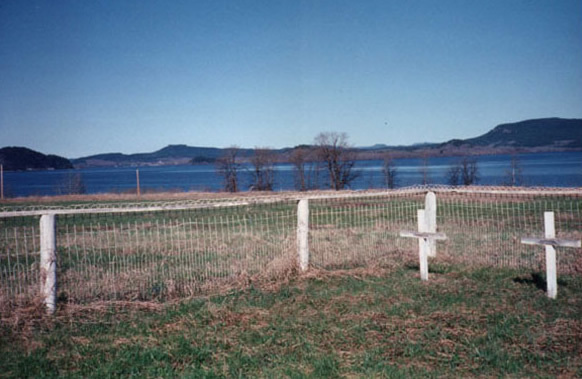 In 1951 it was decided to relocate a few graves that were west of the Lejac Indian Residential School to another larger cemetery nearby. During the transfer the casket of a young woman named Rose Prince broke open. She had been buried two years earlier. The grave of Rose Prince is honored. The workers were amazed to find both Rose’s body and clothing perfectly preserved. Other bodies were examined. All of them, some buried after Rose, were found to be decaying. When witnesses were called, including some Sisters, they found her body in perfect condition. She seemed transparent and looked as if she were sleeping. There was “just a tiny little smile on her face”. A bouquet of withered flowers was on her chest. Among Catholics such bodily incorruption has a very special meaning. The church accepts this as a sign from God which witnesses to the life of great holiness. It is a miracle that reflects the victory of Christ over death and is echoed in the words of Scripture, “You will not allow your holy one to experience decay” (Acts 13:35). Over the centuries the bodies of some holy people have remained intact long after their death. About two hundred such cases have been known. Unlike a mummy, these bodies remain intact, fresh and pliable. This state lasts sometimes only a few years and other times much longer. The discovery of Rose Prince’s body in such a state reminded witnesses of the holy life this young First Nations woman lived and how such a quiet and humble life is a sign of the hidden grace of the mercy of God. Rose Prince was born in 1915 in a small house behind the convent at Fort St. James. She was the third of nine children born to Jean-Marie and Agathe Prince. Both her parents were devout Catholics. Rose’s father was descended from the great hereditary chief, Kwah, who ruled the well developed Carrier society that was centered around Stuart Lake. Jean-Marie often translated for the priest in church and led the prayers and singing. He also helped to look after the church building. Her mother, Agathe, was raised by the Sisters of the Child Jesus in Williams Lake because her own mother died when she was very young. Along with her beautiful auburn hair, Agathe gave to her daughter, Rose, the quiet serenity that characterized her life. She was known to be kind, gentle and a woman of strong faith. Jean-Marie and Agathe went to school together in Williams Lake. They fell in love, were married and returned to live in Fort St. James. Their children first attended the little school in Stuart Lake. Then in 1922 the government built a large new school at Lejac and Rose was sent there. The Government built the Lejac Indian Residential School in 1922 and contracted with the Oblates of Mary Immaculate to provide staff. 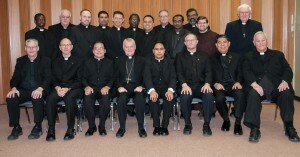 The Oblate Fathers and Brothers were assisted for many years by the sisters of the Child Jesus, and later, the Frontier Apostles. Lejac Indian Residential School was once situated on a hillside overlooking Fraser Lake. Today all traces of it have been removed and the grounds around the graveyard, which remains, are used for the annual pilgrimage. In the years that Rose Prince attended the school she applied herself to learning and became an outstanding student. Sister Bridie Dollard, who taught Rose for three years, described her as “a hard worker and a brilliant student, kind, lovely, gentle and compassionate”. Some of her fellow students remember her as a happy child with a natural sense of dignity. Her goodness and understanding attitude drew other children to her. One childhood friend says, “Sometimes I would feel resentment towards the Sisters or the other girls, or someone who said something to me, and then she would talk to me about it and say to pray for the person instead of feeling resentment. She was full of advice like that”. Although she came from a loving home, Rose’s life was not easy. She developed a curvature of the spine that resulted in a hump on one side of her back. The pain made it awkward for her to get around and very difficult to kneel. Sister Bridie remembers that “she was very self conscious about it.” Yet all those who gave testimony about her agree that never once was she heard to complain. In 1931, while Rose was at school in Lejac, her mother died during an influenza outbreak. Her death was almost unbearable for the young Rose. Soon after she also lost her two younger sisters. From that time on, although her brothers and sisters went home each summer, she did not want to join them but instead chose to stay at the convent. 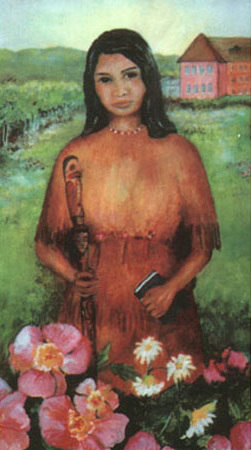 Rose also began to develop a deep life of prayer and seemed to have an abiding sense of the love and presence of Jesus. After graduation Rose asked to stay on at the school. Because she was loved and respected she was accepted as part of the staff. To a friend she confided that it was the best choice for her. Here she could be herself, enjoy quiet and privacy and practice her faith. Her spiritual life continued to bloom. She had a special devotion to the Eucharist. In spite of the difficulty that her deformity caused her when kneeling, she spent hours at prayer in the chapel. As an adult, religious practices were optional, yet Rose faithfully received Jesus at daily Mass. No one ever heard a cross word from her and she did her tasks with great cheerfulness. Rose loved to sing and always sang or hummed while she was doing her chores. Her fingers were always busy with beadwork or crocheting. She was a talented artist who spent hours collecting and examining flowers before painting them in great detail on altar cloths and tabernacle veils. She often gave away small paintings as gifts but only a few of her pieces have survived. Rose contracted tuberculosis and by 1949 had grown so weak that she was eventually confined to bed. In August of that year she told Sister Francis, who was leaving on holiday, that she would never see her again. She was admitted to the hospital on August 19th and quietly passed away that evening while Mass was being offered for her. 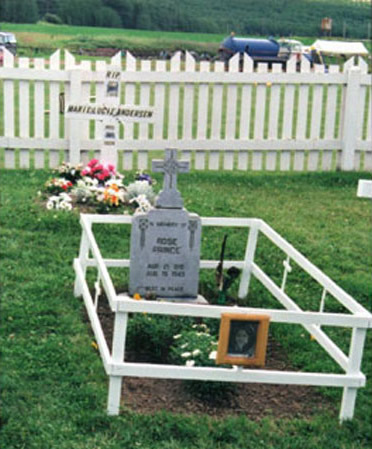 The Sisters prepared her body for burial. In death, as in life, her body lay awkward because of its deformity. They put a pillow under her head and put her body in the right position. Sister Rose later said that she looked like an angel lying in her coffin. Rose Prince was buried on her 34th birthday, a special day she was now able to celebrate with all her heavenly family. Today those who stop to pray by her grave at Lejac, seek the intercession of this quiet and unassuming soul whose ordinary and hidden life was made rich by faithfulness to the sacraments and by prayer. Fraser Lake as seen from the Graveyard. Click on the MEDIA GALLERY button to check out Catholic news and views.